With super views of the Dhauladhar and Pir Panjal Ranges, and the fast-flowing Beas River running through the town, Manali is a year-round magnet for tourists. Backpackers come to hang out in the hippy villages around the main town; adventure tourists come for trekking, paragliding, rafting and skiing; and Indian honeymoon couples or families come for the cool mountain air and their first taste of snow on a day trip to Rohtang La. Over the years, many tourists have been lured here by the famous Manali charas, which is seriously potent stuff . Though in Old Manali it’s smoked fairly openly, it’s still illegal and local police do arrest people for possession (or hit them for bribes). As the main jumping-off point for Ladakh, Spiti and Lahaul, it makes sense to unwind here for a few days before continuing the long journey into the mountains. Daily buses and jeeps to Leh, Keylong and Kaza leave from approximately June to October. 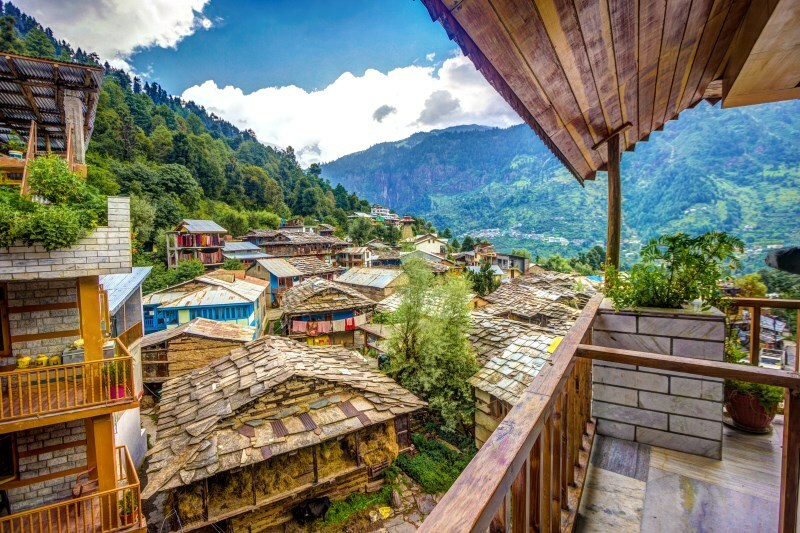 Most travellers stay in the villages of Vashisht or Old Manali, which have a laid-back vibe and plenty of services, but close for winter from sometime in October to May. Manali’s main street is the Mall, part of the highway that runs into town. The bus and taxi stands are here and most hotels and restaurants are on alleys to the west. Two roads run north from Manali along the Beas River – one to Old Manali on the west bank and one to Vashisht and the Rohtang La on the east bank. Also known as the Dhungri Temple, this ancient wood and stone mandir was erected in 1553. Pilgrims come here from across India to honour Hadimba, the wife of Bhima from the Mahabharata. The walls of the temple are covered in woodcarvings of dancers, and horns of bulls and ibex adorn the walls. Grisly animal sacrifices are carried out in May for the three-day Dhungri Mela. Photo-wallahs loiter around the temple offering souvenir photos in traditional costume, with your arm around a yak or angora rabbit. Ghatotkach, the son of Hadimba and Bhima, is worshipped in the form of a sacred tree near the temple. Villagers make offerings of knives, goat horns, and tin effigies of animals, people and houses. There’s a small Tibetan colony just south of the town center. The Himalayan Nyinmapa Buddhist Temple, contains a two-storey statue of Sakyamuni, the historical Buddha. Further along the same lane is the more traditional Gelukpa Cultural Society Gompa (Map p308; h6am-6pm), with an atmospheric prayer room crammed with statues of bodhisattvas, revered lamas and Buddhist deities. There’s also a small workshop producing Tibetan carpets. zone. 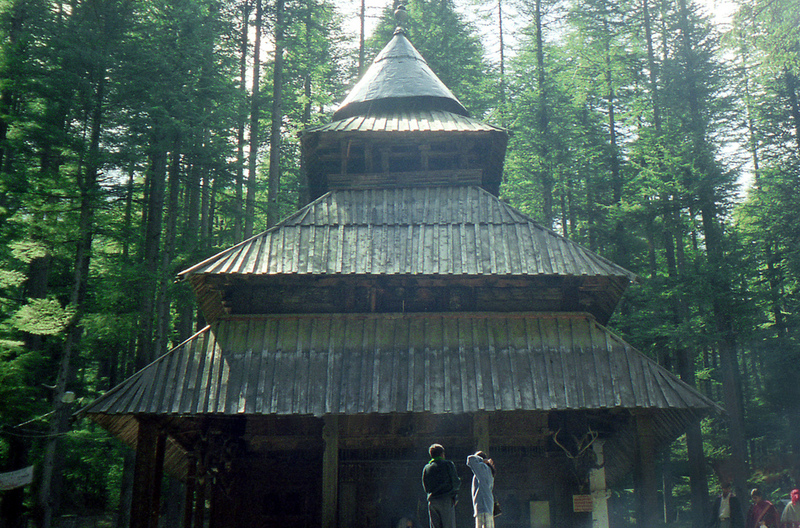 There are some remarkable old houses of wood and stone, and the towering Manu Maharishi Temple is built on the site where Manu is said to have meditated after landing the boat that saved humanity. A trail to Solang Nullah (11km) runs north from here through the village of Goshal (2km). Nature Parks PARKS. A large grove of deodars (cedars) on the banks of the Beas has been set aside as a nature park with a small aviary of Himalayan birds, including the monal pheasant, Himachal’s state bird. South of the centre is the similar Van Vihar Park. 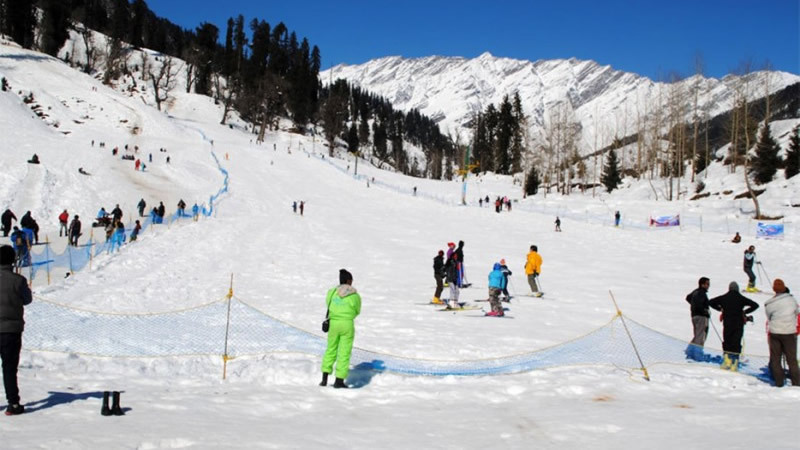 Manali is the adventure sports capital of Himachal Pradesh, and all sorts of outdoor activities can be organised by us. The rivers of the Kullu and Parvati Valleys are rich in trout and mahseer. The season runs from March to June and October to November, and rods and tackle can be hired from agencies in Manali; daily fishing licences from HPTDC cost ₹500. Top spots include the upper tributaries of the Beas and Parvati Rivers at Kasol. Jeep safaris can be arranged to Ladakh, Lahaul and Spiti for around ₹5000 per day, visiting monasteries, mountain passes and glacial lakes, with accommodation in tents or village guesthouses. Though you may think that the steep slopes around Manali would have some prime mountain biking, you’ll probably have to take a car to most tracks that are worth riding. 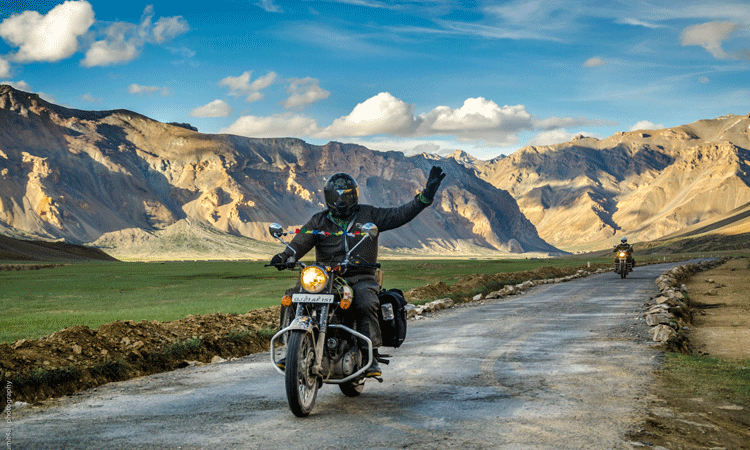 Agencies offer bike hire for ₹990 to ₹1650 per day (and can give current info on routes) or you can organise tours to Ladakh, Spiti and Lahaul. One audacious day trip is the descent from the Rohtang La – buses and taxis can transport you and your bike to the pass, then you can freewheel down. On all high-altitude routes, take time to acclimatise. Visit our page to know more about the package and route map. Mountaineering training can be arranged through the Directorate of Mountaineering & Allied Sports ( www.journeytoexplore.com), in Aleo, 3km south of Manali. Basic eight-day mountaineering courses run between May and October for ₹7400/21,000 (Indian/foreigner), including food, accommodation, guides and training. The courses cover essential trekking techniques and a series of local ascents. Local agencies can arrange expeditions to Hanuman Tibba (5930m) and Deo Tibba (6001m). White-water rafting trips on the Beas River can be arranged in Manali, starting from Pirdi, 3km downriver from Kullu. There is 14km of Grade II and III white water between Pirdi and the take-out point at Jhiri; trips cost around ₹1800 per person. Book through us. For booking please visit our page. The cliff’s at Solang, Aleo and Vashisht have a good range of bolted and traditional routes ranging from French 6a to 6c (British 5a to 6a). Himalayan Extreme Center (p 305 ) in Vashisht offers day trips for ₹2500/1900 per full-/half-day, including all equipment. Independent climbers should bring a selection of slings, nuts and cams (particularly in the smallersizes) and a 30m or 60m rope. Popular options include Beas Kund (three days), the Pin-Parvati Trek from the Parvati Valley to Spiti (eight days) and the Hamta Pass (4270m) to Lahaul (fi ve days).